IoT Utilities Market size was valued at over USD 4 billion in 2016 and is forecast to grow at a double-digit CAGR over the forecast timeframe. Rising focus of make energy usage more efficient to relieve stress on increasing energy demand is expected to drive the IoT utilities market over the forecast timeline. Smart grid modernization across regions such as the U.S. UK, China, etc. lies significant growth opportunities. Moreover, government initiatives associated with smart grid in countries such as Japan and India is expected to boost the demand for the market. Increasing adoption of cloud-based platforms across the utility industries for remote monitoring of the facilities industries are implementing advanced solutions to gain the visibility into each step of the business processes with high investment on infrastructure development. Lack of interoperability coupled with the unavailability of proper standards might hinder the market growth over the forecast timeline. In addition, lack of skilled workforce with low technical expertise coupled with rising number of cyber-attacks across industries will restrain the implementation. Network management platform is expected to witness significant growth in IoT utilities market over the forecast timeline. This is attributed to the increasing demand of management of devices operating in the IoT network. This platform enables the users to make a transition to the grid by allowing them real-time visibility across the pipeline and grid assets. It gives operators the visibility to respond quickly in case of any emergency such as gas leak from the facilities. Device management platform dominates the market with a significant revenue share owing to the high need to manage devices in the system generating enormous volume of data. Streamlining the transition of information in the utility operations can be obtained by usage of such platforms resulting in enhancing the overall efficiency with cost optimization. Declining prices of components such as sensors and ICs is anticipated to fuel the IoT utilities market growth. Increasing demand to monitor the status of the equipment followed by the health of workers performing the tasks contributes to the high demand for advanced sensor devices. Sensors are implemented at various check points across the industrial plant in order to monitor the assets as well as for data generation purpose. The data generated from the sensors provide clear insights to identify any type of leaks or damaged infrastructure. It helps in saving time in searching for the problem enabling the users to repair timely thus limiting the damage. Connectivity technologies will also grow considerably owing to the increasing demand for maintaining proper communication among the devices operating in the network. Hardware segment dominates the IoT utilities market owing to the increasing investments in hardware integrated with advanced digital solutions across the industry. Devices such as smart meters placed in a facility connects to a smart energy grid enabling the companies to manage the energy flow in such facilities in an effective manner. Data is collected from the meters automatically by the operators eliminating the need for visiting physical meter in the field. Component such as smart meters are growing in popularity among the companies operating in the utility industry owing to the features such as remote location, identification of grid fault and restoration in real-time. Professional services are dominating the revenue share in the IoT utilities market due to the increasing demand from utility companies for highly customized business as well as consulting services. The benefits of using professional services helps enterprises to mitigate risks by developing & prioritizing strategies, optimize the performance & security resulting in improving the business processes. Furthermore, range of consulting services are being offered by these providers include development strategy followed by data & application services. Gas management is expected to witness significant growth in IoT utilities market over the forecast timeline owing to the increasing demand from the users to remotely monitor facilities coupled with any fault or leak detection. The leakage in pipelines and any fault in the facilities may lead to a huge disaster which lies huge growth opportunities. However, electricity grid management segment is expected to continue the dominance pertaining to high implementation and rising use cases across the industry. The U.S. will continue to dominate the IoT utilities market due to the high awareness of the users regarding the benefits of implementing IoT technology that helps in managing their resources. Moreover, the presence of large number of gas production facilities in the country supports the rising demand to implement such solutions. The presence of several electricity production facilities followed by gas production facilities in the Asia Pacific region provides significant growth opportunities to the market. Growing trend of digitization coupled with the rising use cases across industry is expected to fuel the demand over the future. Increasing investments on advanced technologies by the utility companies contributes to the growth. 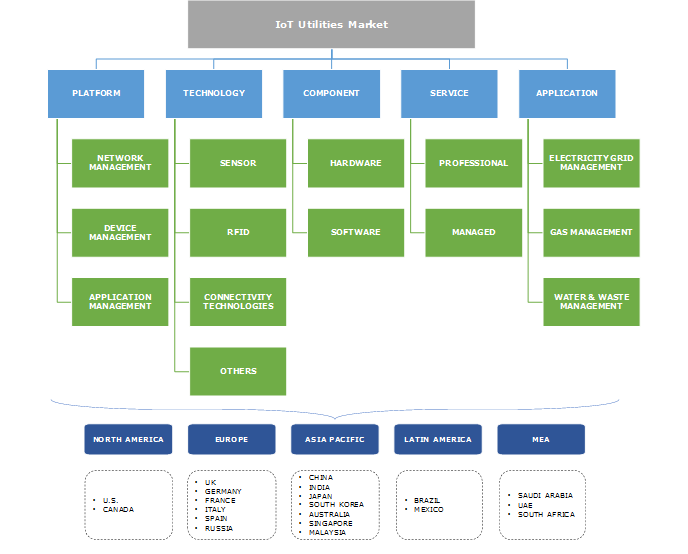 Key players in the IoT utilities market include Cisco Systems, IBM Corporation, Intel Corporation, Huawei Technologies and Microsoft Corporation. Other prominent players include Honeywell International Inc., General Electric, Osisoft LLC and Trilliant Inc. Players operating in the market are increasingly focusing on utility companies to boost the transformation of product and service offerings with the use of digital technology. The players are heavily investing on the R&D of fully connected solutions for every aspect of the utility industry. The utility industry continues to face difficulty related to the complexity and high costs associated with maintaining their assets. Rising incidents of cyber threats poses significant challenge to the industry growth. IoT technology is witnessing huge adoption in the industry to remote monitoring of assets, pre-identification of faults and restoring without physically visiting the facility. Also, the implementation of the technology for electricity grid management is helping the companies to achieve their goals of efficiency, reliability and environmental responsibility.